Things to do & Places to Eat in Rome ! Now that I’ve visited Rome, I finally understand where the saying “Rome wasn’t built in a day” came from! Everywhere we visited, we were simply amazed at everything we saw. We would be in a very modern part of the city and the moment we turn the corner, there would be century-old ruins in right in front of us…and somehow, it just falls into place perfectly! I was also fascinated by the detailed architecture…it felt like every brick was sculpted individually and precisely to perfection…simply amazing! I know there’s plenty of websites out there telling you ALL the things you can do in Rome, so instead…I’m going to provide you MY list of must dos and must eats and also give you some useful tips to make the experience even better! My number one highlight in Rome was definitely the Colosseum! Yes, I know… it’s probably listed in all travel guides and you’ve seen it many times in pictures but wow, seeing it in person it is quite something! The moment you enter the arena, I was shocked to see how huge it was. 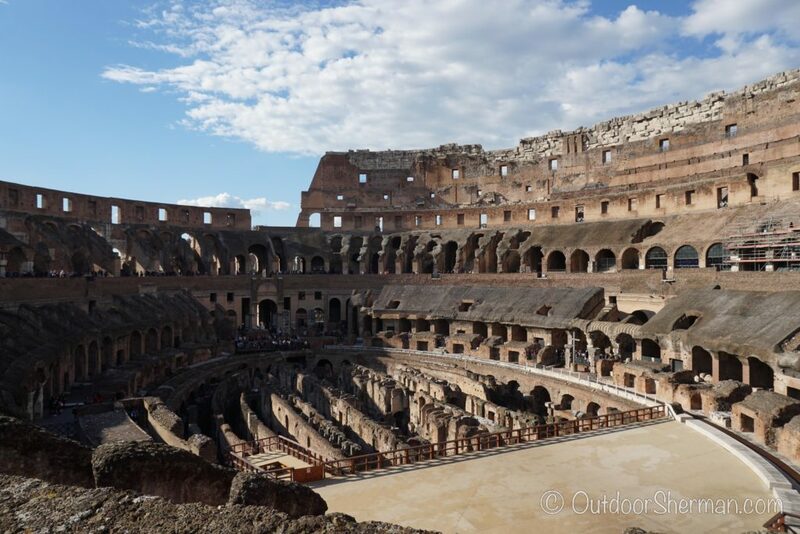 There’s so much history behind this building that during our visit, I couldn’t help but to imagine gladiators coming out of the different parts of the arena, preparing to battle; they must have been very scared! You can’t help wonder how it was possible for the Romans to build such a spectacular architecture back in the day! 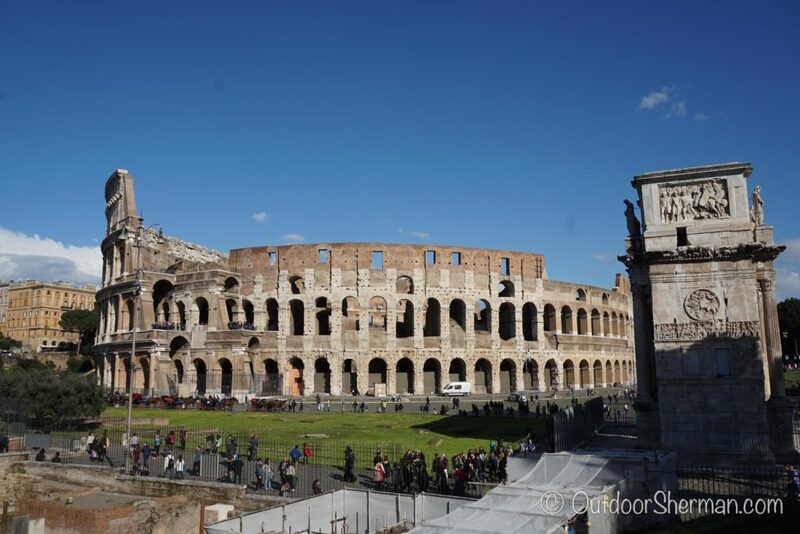 Tip #1: Instead of renting an audio guide for extra money, we had previously downloaded Rick Steves’ audio app with his Coliseum Walking Tour on our iPhones, so we were able to get a better understanding of all the things we saw during our tour. Maybe that’s why I enjoyed my visit so much! 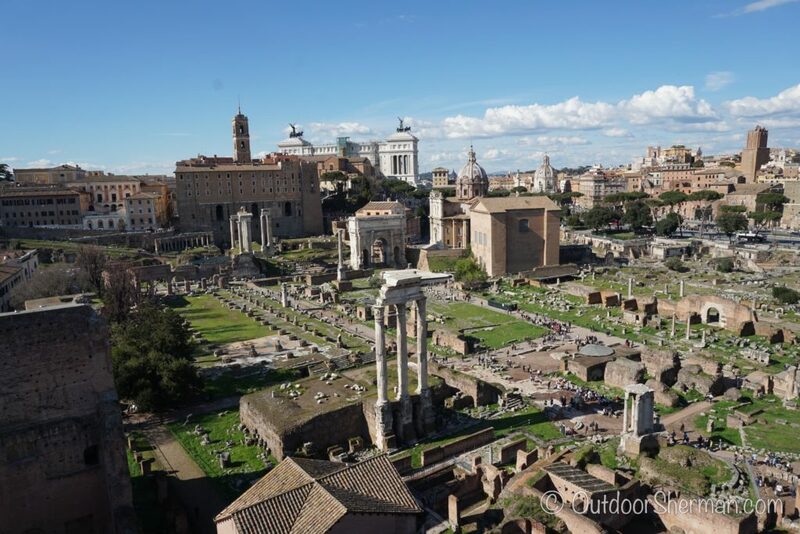 Tip #2: Lineups to the museums are LONG (even during low season) so if you want to avoid waiting in line for hours, I highly suggest you get a Roma Pass (click my video below or here to see why it’s worth it to buy the pass!)! It’s true that it’s cheaper to buy the museums passes and public transport tickets individually BUT you save so much time waiting in line, I definitely think it’s worth it! 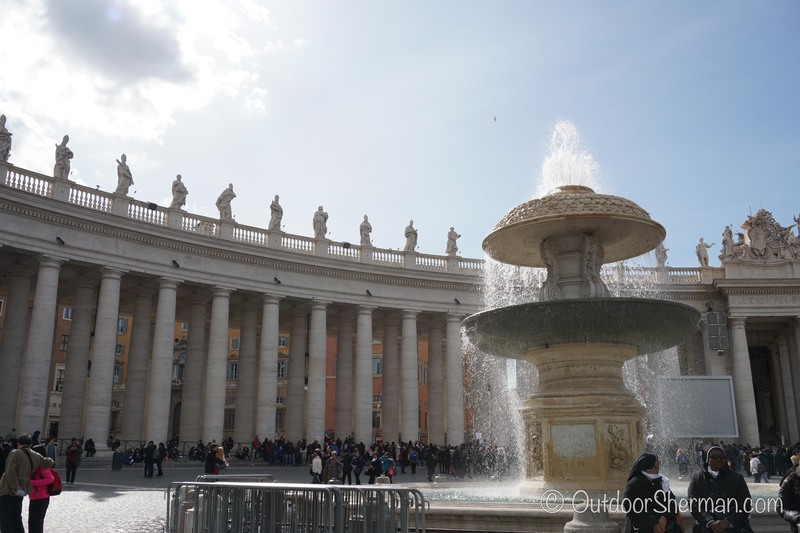 The second must do in Rome is visiting Vatican City! I know…another typical attraction listed in every guidebook out there but for me, I’ve seen in so many times in the news that I just wanted to go there and see it for myself! The place was huge! Although there was nothing special happening that day, you could just imagine how crazy it must be when it’s completely filled with people! I’m not a religious person but I was still in awe when I stepped into the Piazza San Pietro (St-Peter’s Square). The St-Peter’s Basilica is open to the public so it’s definitely worthwhile to take a look inside but the only downside is there’s always a lineup since you have to go through a security check. Once we were inside, we picked a spot to sit down so we could admire the art and architecture inside the building…it is quite a sight! 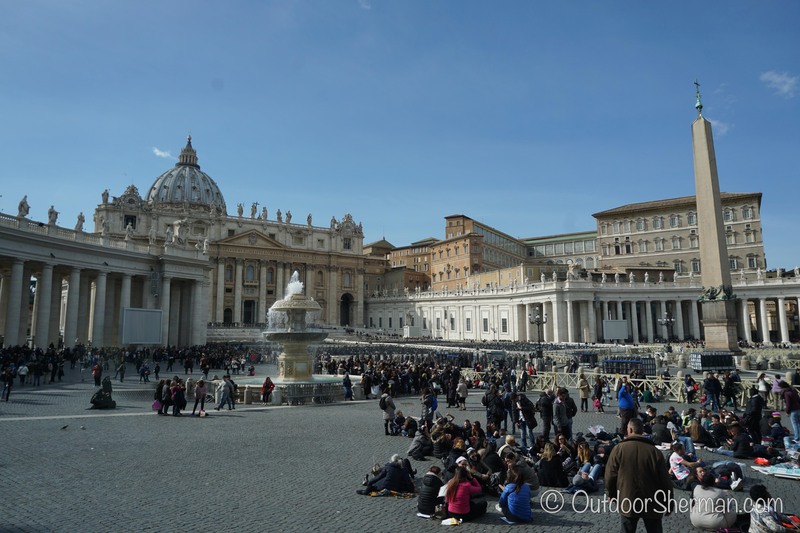 Tip #3: Remember that accessing the Piazza San Pietro and the Basilica is FREE! When we got out of the metro station, we were so lost and started following the crowd but little did we know they were going to the Vatican Museums which we weren’t planning on going! So if you end up somewhere where you have to lineup, that’s not the entrance to the Vatican City! 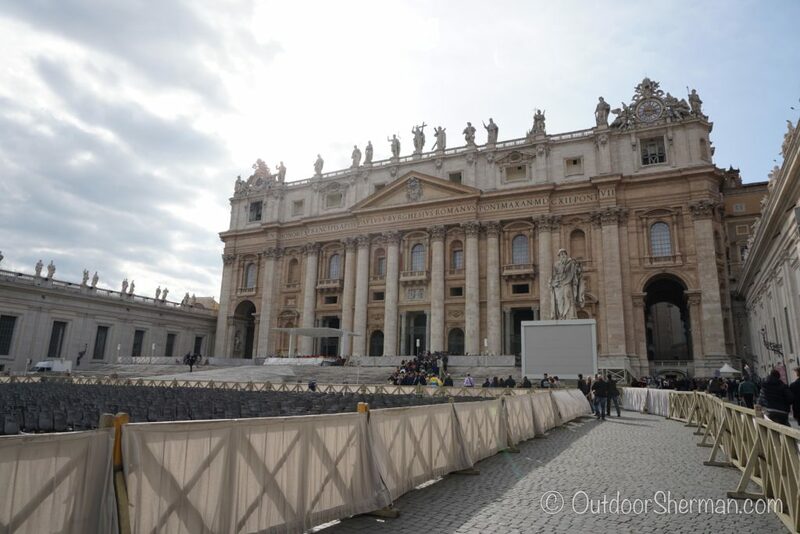 Tip #4: There’s usually quite a bit of people lining up to go inside the St-Peter’s Basilica because of the security check, however, if you’re lucky and you happen to visit when they open the Holy Door, go to that line! When we asked, they said these were two separate lines so we chose the Holy Door one because it was much shorter…but once we passed through the Holy Door, we were already inside the Basilica! So in a way, we got to do both while going through the shortest line! Bonus! And finally, the last thing I’d suggesting doing is just to admire the Italian street artists creating their masterpieces on the streets of Rome. When we were heading to the Trevi Fountain, we came across a very young girl who was doing spray paint art of the Coliseum. My sister and I were simply mesmerized by her talent! She swung her spray paint cans around and used so many cool techniques that it literally felt like we were watching a show! If you don’t believe, see for yourself…this is a video I took when she was creating the painting for us! As for Rome’s must eat, I Dolce di Nonna Vincenza, is a coffee shop you definitely have to go. There’s one really close to Campo de’Fiori so when you’re passing by that area, you should consider dropping by. We tried their cannoli and it was amazing but the highlight was definitely the coffee. It was so smooth…I’ve never tasted anything like that…and it was by far the best coffee we had in Italy! Testaccio Market is another great spot to grab a quick bite. It’s located a bit further away but if you take the metro, you’ll get there after a short walk. It’s a really nice market to visit: you have your local market area where families come to buy groceries, you also have some little boutiques selling shoes and bags (my sister got a really cute bag here! ), and finally, you have your food stalls! We absolutely loved Mordi & Vai; they sell these cheap and delicious sandwiches…perfect for a quick lunch! We ordered the trippa alla romana panino (Roman-style tripe in tomato sauce) and the panino con alleso (boiled beef with the bread dunked in broth)…they were both AMAZING! I’m Chinese so I love eating tripe but despite that, I did prefer the beef one better! The best thing of all, it was really cheap! It cost us 8.50 euros for both sandwiches and a baby bottle of white wine! What a deal! We followed Lonely Planet’s advice and dropped by Forno Roscioli Pietro for dinner. This is not a typical restaurant so don’t expect a fancy meal. It’s more of a family owned store where locals come to pick up food to bring home. They have several tables set up so we decided to give it a try. Most of the people working there didn’t speak much English (which means it’s legit!). Luckily, a younger guy working there was able to help us out. They had all kinds of little goodies so we decided to go with their mushroom and meat pizza along with a roast pork and crackling focaccia…mmmm delicious! What I liked most about the place is their friendly atmosphere. We were too full to get any desserts but the guy brought us a few cookies and said it was on the house! The place is located a bit out of the way, but it’s worth the walk, and I’d definitely go back next time I’m in Rome! Here is a map showing all the must dos and must eats in Rome!